This is a very durable table base. It can be used inside and outdoors in good weather. The base is very easy to maintain keep clean. Free delivery offered to all mainland UK addresses. 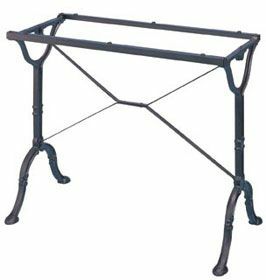 Cast iron traditional café table base available for quick delivery and offered for a number of commercial applications. These table bases can be used with rectangular table tops. Please contact our sales team for further action.